1 Your Data, Delivered Daily! 2 Get Your Systems Synchronized! 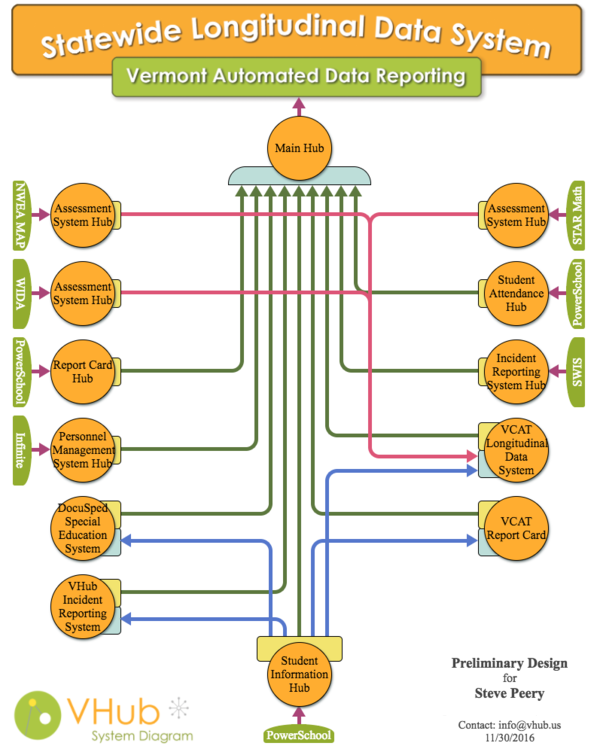 VHub is the complete solution for the Vermont Agency of Education's new Automated Data Reporting (VADR) requirement. Vhub provides an intermediary database that holds validated data for transmission to VADR and a network of independent "Hubs" that communicate with each other using normalized data based on state specifications. Most supervisory unions have a Student Information System (SIS), Report Card System, Assessment Systems, Learning Management System (LMS), Local Data System, Special Education System, Mass Notification System, Combined Incident Reporting System (CIRS), Personnel Management System, and more. With VHub, your systems can be linked together for easy synchronization and automated data delivery to the state. In order to better visualize all the different systems you use and how they will communicate with the state, we have created VHub Design. It's a website that allows you to identify the systems you use in each school in your SU and produce your very own VHub system diagram. To design your own VHub system diagram, click VHub Design. The first time you visit the site, you'll need to create an account (email and password). Once logged in, select your SU/District, type your first name, last name, and title. Click Next on the top right. You'll be presented with one page for each school. The school name shows under the VHub Design title at the top. For each system type (row), select the system name using the up/down arrow. If the system you use is not listed, please select Other and type its name in the text field on the right. When the first school information is completed, click Next on the top right. It will bring up the next school, and will be pre-filled with the information from the previous school. Make changes if needed and press Next again. On the last page of the process, answer a couple quick questions then click on Create Diagram to get your very own! This page was last modified on 23 January 2018, at 21:57.